I'm cheating here, since we haven't actually had a chance to try this one out, but it has an excellent reputation. They are famous for their roasted chicken which is supposed to be spectacular. A great French brasserie. Lots of atmosphere and excellent food. Better make reservations, as it gets pretty crowded here after 8:30 or 9:00 p.m. In fact, except for Mirama (see below), you should probably reserve at all of these places. This is a relatively traditional style French restaurant. Not outrageously expensive by Parisian standards, but still a bit on the pricey side. If you are there in the late spring, summer, or early fall, they have tables outside so that you can look at the river and the cathedral. Beautiful surroundings. 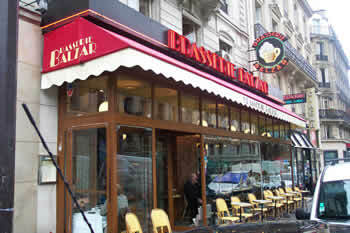 One of the best known, classic restaurants in the Montparnasse area. The restaurant portion is excellent but on the expensive side. We actually enjoy eating at the brasserie tables. There are fewer choices on the menu but they are all excellent, and the prices are somewhat lower. You can get one of the best steak-frites in Paris here. This is one of our favorite places to take a break in the afternoon. I wouldn't recommend it for regular food, unless you're just in the mood for something light like a sandwich or an omelette. We come here for the ICE CREAM -- specifically Berthillon ice cream -- some of the best ice creams and sorbets anywhere. To top it off, there's nothing better than sitting at a table here on a sunny afternoon, looking at Notre-Dame and the Seine, and realizing that you're eating ice cream in Paris. This is a cafe situated on the Place des Vosges on the right, just as you enter the Place from the rue des Francs Bourgeois. I love the Place des Vosges, which is a charming square with a little park in the center, surrounded by beautiful 17th Century "hotels particuliers", which have now been turned into very expensive apartments. The sidewalks are partially covered by archways, there are lovely shops (expensive), and it is a location often used in French films. I sometimes come here for breakfast or, if we're meeting someone, afternoon tea. Our apartment is not too far away. Even though it's a bit of a tourist-trap pricewise, being able to sit in this location is worth it. One of the best Chinese restaurants in Paris. In fact, it's our favorite Chinese restaurant anywhere. They are famous for their soups and their barbecued meats (which are called laqués in French). Not fancy, not expensive, but a great choice for a quick, delicious lunch.